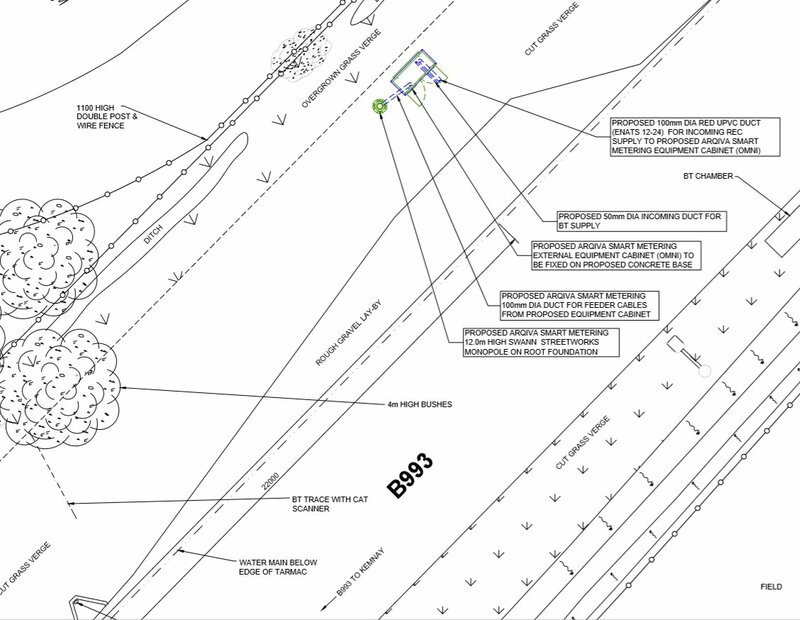 Planning application submitted on 04/09/17 for Electronic Communications Code Operators (Smart Metering) for Erection of 12 metre Smart Metering Monopole with 3 metre Omni Antenna and Associated Ground Based Equipment Cabinet, on Eastbound Grass Verge, B993 (just north east of the junction of Fyfe Park / Victoria Terrace), Kemnay. Applicant: Arqiva c/o Harlequin Group, Rutland House, 5 Allen Road, Livingston. Expiry date for public comment Mon 11 Sep 2017. 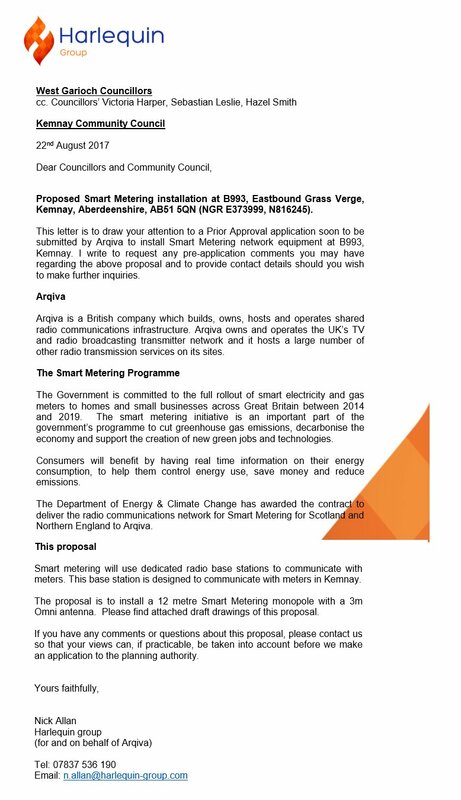 Kemnay Community Council draw your attention to a Prior Approval application soon to be submitted by Arqiva to install Smart Metering network equipment at B993, Kemnay, in particular a 13.5 mtr. high mast. On 22 August 2017, Harlequin group (for and on behalf of Arqiva) wrote to request any pre-application comments you may have regarding the above proposal and to provide contact details should you wish to make further inquiries. For clarification, the deadline for pre-application comment direct to the applicant is 05 September 2017. The applicant will process any such comment prior to submitting the subsequent planning application to Aberdeenshire Council (AC). Once the planning application is validated by AC it will appear on the AC website page and this website here. On the planning application page you will see the the AC expiry date for public comment on the planning application. When the planning application is validated you will also see a link below this paragraph or you can search the AC website for it here. The coverage provided by each site varies depending on a number of factors including antenna height, antenna type, surrounding topography, and presence of trees and buildings in the proximity of the site. In this instance, and to ensure that any visual impact is reduced where practicable, we are proposing a stealth solution – a thin monopole with a very thin Omni antenna (see image below). This is the least obtrusive option and is deemed more suitable to this urban environment than a standard lattice tower with a fenced compound. 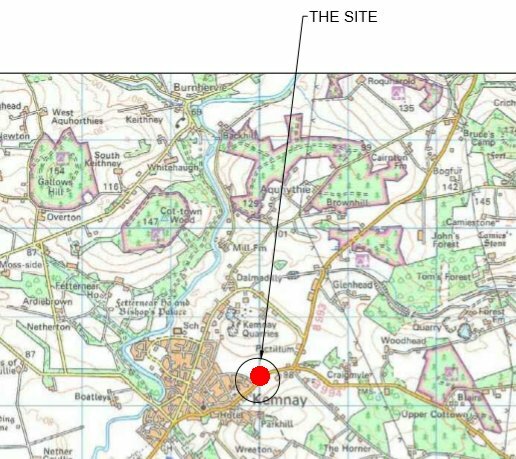 The use of this low capacity configuration, to reduce visual impact, means the site must be situated in close proximity to the properties it is designed to serve – i.e within Kemnay. 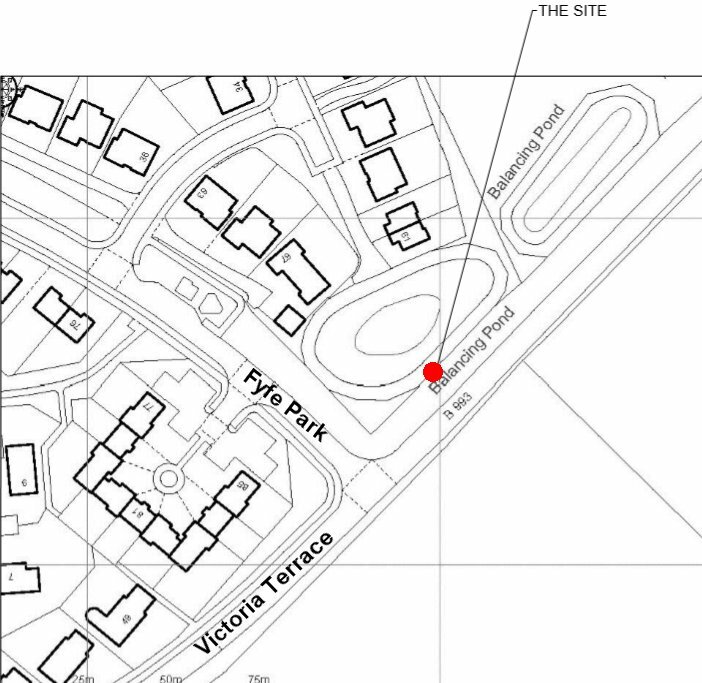 For reference, our proposed site sits at an elevation of 93mAOD. Below are a number of options which were assessed and then discounted on various grounds – from town planning and visual impact, to elevation and coverage issues, as well as footpath width. 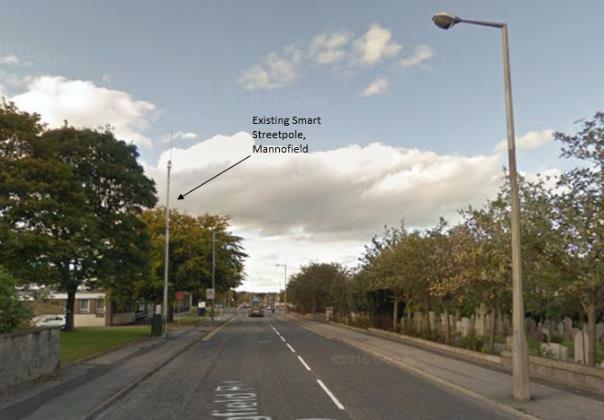 Existing EE streetpole – this site is a shrouded streetpole design which cannot be redeveloped to accommodate the Smart Metering Omni antenna. Kemnay Golf Club – this site lies too far south of Kemnay to provide the required Smart Metering coverage to the area. Bremner Way East – this site was investigated to accommodate a new installation, but, as this land lies approximately 84m AOD, the required Smart Metering coverage would not be achieved. Grove Road – this site lies lower, elevation-wise, than the proposed site and would therefore not provide the required coverage. Fraser Place – this option was discounted on town planning grounds due to the close proximity of residential properties. 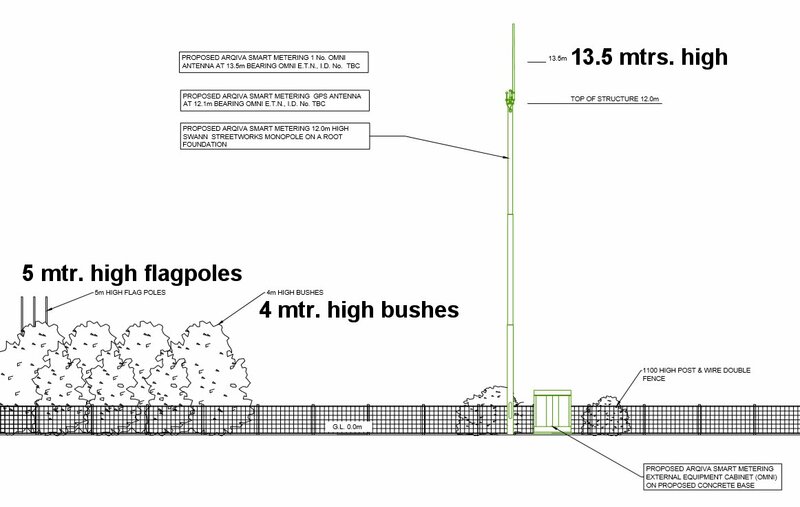 Aquithie Road – this option lies on a lower elevation (85m AOD) than the proposed site and would therefore not provide the same level of coverage. Additionally, this option was discounted due to a lack of footpath width at this location. Bremner Way West – this site was investigated, and subsequently discounted due to a lack of elevation (76m AOD) which would result in a lower level of coverage being achievable.